When it comes to second acts in life, there are few more remarkable than the one author Lee Child has written for himself. "My dad, I remember when I lost my job, he said, 'What are you gonna do?' And I said, '"I'm gonna write a book.' And he said, 'I'll lay 'ya 10,000 to one it won't work.' And I guess that's pretty accurate - 10,000 to one, probably." While his face may not be familiar, if you've been in a bookstore any time in the past decade or so, chances are you've at least glanced at one of his books. Because Lee Child is arguably the hottest mystery writer around. His books jump straight to the best-seller list. His 15 high-octane thrillers have sold more than 40 million copies in 75 countries, translated into 38 languages. "It's a funny feeling," Child said. "And you don't want to come right out and say, 'Yeah, you know, I'm thrilled about it.' But I am. You know, it's really a great thing to know that all around the world, people are sitting down right now, right this moment. Somebody is reading one of those books." In fact, in New York City this week, crowds lined up to meet Child and buy his latest book, "Worth Dying For." Earlier this month, at a convention of mystery writers and readers in San Francisco, the lean, affable Englishman enjoyed rock-star status. "I feel like I won the lottery!" said one fan. "Thank you, sir - they're wonderful books," said another. It's an astonishing success story, made even more amazing by the fact that, but for a simple twist of fate, Lee Child may never have been born. His birth name was Jim Grant. 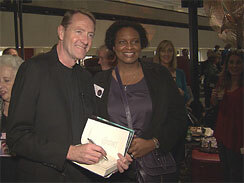 "You changed your name to Lee Child as an author, as a rebirth. Is it completely you're shedding one identity, assuming another? A rebirth of a career?" asked Keteyian. "Yeah, it was like that," Child said. Child was born in England in 1954, the son of a civil servant. While far from poor, the family lived paycheck to paycheck. "They had no money for luxuries," he recalled. "But fortunate for me, they didn't think of books as luxuries. You know, they were that kind of family, that kind of generation that really revered education." That education paid off. He got a job in British television, and for 18 years worked on such high-brow, high- profile projects as "Brideshead Revisited," and mysteries like "Prime Suspect." "I was these guys on the other side of the camera, and it was a great job - loved it. Absolutely loved it. "And if I hadn't been fired, I would still be doing it, and still loving it. But I was fired." Suddenly without a job at age 40, with a wife and young daughter to support, he made a leap of literary faith. "What I wanted was to stay in the world of entertainment," Child said. "I mean, that's all I've ever wanted to do. It's all I've ever been good at. And I thought, well, you know, I know the audience. I know how they think. Let's try writing a book." So he sat down at his kitchen table with nothing but a legal pad and this now well-worn pencil. In 5 months Jim Grant - reborn as Lee Child - wrote his first novel. "Killing Floor," set in the United States, earned rave reviews, and introduced the character who would secure Child's place in the pantheon of great mystery writers: a 6 foot, 5 inch tall, 250 pound ex-U.S. Army military cop named Jack Reacher. He's described in the book as "a rock." "Yeah, he's a big guy," Child said. "No vulnerability. He is who he is. He's confident, practiced, professional. He's got the physical strength, he's a force. In other words, he's the hammer. He's not likely to be the nail." A hard guy with a tough-sounding name that, ironically, Child came up with while grocery shopping with his wife Jane. "I was out of work, so we go to the supermarket. And every time that I've ever been in a supermarket, I walk in, and a little old lady comes up to me and says, 'You're a nice tall gentleman. Would you reach me that can?' So my wife said, 'You know what? If this writing gig doesn't work out you could be a reacher in a supermarket.' And I thought, Good name." Like Dirty Harry and Phillip Marlowe, Reacher is the latest incarnation of the noble loner . . . strong silent types who drift into trouble, righting wrongs along the way. "We walk around and, whoever we are, we're somewhat nervous, somewhat intimidated, little afraid," Child said. "Wouldn't it be great just to know for sure, for absolute certain, that you've got nothing to be afraid of? Reacher's 100 percent confident. He walks into those situations - three bad guys, six bad guys, whatever - he knows they're gonna lose, you know? "It's simply a question of, are they gonna be limping for a week, or are they gonna be in a wheelchair the rest of their lives?" In the hands of this master craftsman, Jack Reacher has become that rare literary creation - a character so well drawn he's inspired a cult following . . . self-proclaimed "Reacher Creatures." At the mystery writers conference, they were out in force. "They are a bunch, I'll tell 'ya!" Child chuckled. "A passionate bunch, and faithful, loyal. They show up everywhere. They know more about Reacher than I do, practically, 'cause they, you know, they're so into it." So what do they like about Reacher? "Oh gosh!" said one woman, indicating the close proximity of her husband. "I have to be careful about what I say!" "You can't help but love Reacher," said another fan, "because he's the white knight that we all want." "He has strong morals; he fights for the underdog. Just an overall good guy, and he doesn't take any guff from anybody," was another assessment. With a following like this, it's little surprise Hollywood has come calling, optioning all the Reacher books. A film version of one is now in the works. And if you want to see what Jack Reacher might actually look like . . . take a look at 6 foot 3, 230 pound Duncan Munro of Australia. He recently won a Reacher look-alike contest. Munro's life is not all that different from Reacher's: "There are some similarities," he told Keteyian. "I work with the Federal police force, and I've been in the army for 13 years, as an officer." In his pristine New York City apartment, Child is already hard at work on Reacher's next adventure . . . coffee and cigarettes close at hand. He's living proof you can author whatever life you choose. "There are probably hundreds, if not thousands, of would-be mystery writers, novelists, watching this," Keteyian said. "What advice do you give them?" "I give 'em the advice, 'Ignore my advice,'" Child replied. "Because a book can only work if it has a spark in it, if it is 110 percent yours and full of integrity, and it's organic. Somebody else will like it. Maybe thousands of people. Maybe tens of thousands of people. Maybe, if you're lucky, millions of people." Which makes Lee Child about as lucky as you can get.